Don’t you love it when guests arrive from out-of-town and you get to play tourist in Niagara? Just recently my cousin Stacey stopped by for a one day visit. We spent so much time touring Pelham that we didn’t even make it all the way to Niagara Falls. 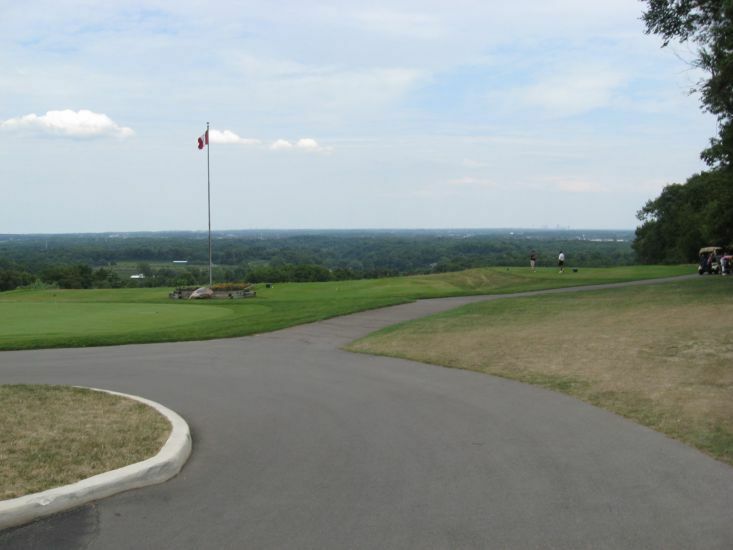 We started off at the Pelham Visitor Information Centre located at the Log Cabin in Fonthill and then we stopped in at Lookout Point Golf Club. The Niagara vista, even from the vantage of the parking lot, is absolutely unparalleled. I explained to Stacey that the Town of Pelham is the highest elevation in the Niagara Region because it is located on a rare geological formation known as the Fonthill Kame-Delta and our surrounding topography features a vast array of glacially formed hills and valleys. Winding country roads and babbling brooks, unique farms, shops and art studios - just the perfect context for an ideal driving or cycling tour on a warm summer day. I showed Stacey our local maple sugar bush locations and we visited the White Meadows Farm store. We tasted a variety of the local farm’s own brand of maple products including salad dressing, red pepper jelly, maple jelly and of course, maple syrup. We enjoyed some sightseeing along one of my personal favourite Pelham routes - Sulpher Springs and Orchard Hill roads. The thought of living on a lane that closes for the winter never fails to conjure up thoughts of Henry David Thoreau and Walden Pond. I’m not quite sure if the owners of Bow-ridge Herb Farm share my idyllic vision of their country setting but we sure enjoyed our impromptu tour of the farm business that they refer to as their retirement project! During our travels we also visited St. John’s Conservation Area, Short Hills Provincial Park and Henry of Pelham winery with our tour ending in Jordan Village. Next time I plan to reverse the route. Sightsee through Effingham first, then tour through Fenwick via North Pelham, the Comfort Maple and Ivan’s Garage, stop at a fruit farm or two, try out some cheeses at Chez Formage, take a break at the Very Berry Tea Room and then visit all four Shoppes of Ridgeville. Our tour will end with a stroll through the newly revitalized Fonthill Downtown and dinner at a sidewalk café. Better yet – I’ll be sure to suggest- why just visit when you can live here too. I happen to know some folks who would love to help you settle in.